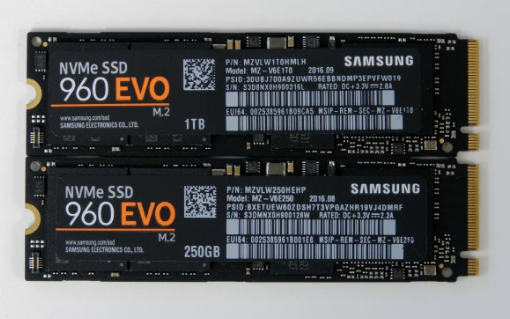 This Samsung 960 EVO Review (250GB+500GB+1TB) covers everything about this SSD. The Samsung 960 EVO 500 GB NVMe – M.2 Internal SSD is a highly reliable and best performance SSD. It features the NVM express protocol with the modern Polaris controller to help the SSD in delivering the splendid transfer speeds. With the best design and modern technology, you can let your computer boots up directly from the Solid State Drive and speed up the application’s startup process. The NVMe and PCIe interface provides the increased bandwidth over the SATA interface. The Latest Polaris controller helps in increasing the sequential read and write speeds and provides more than 3200 MB/s reads speed and 1800 MB/s writes speed. It also includes the latest intelligent TurboWrite technology which helps in boosting write speeds even further. The Samsung 960 EVO equipped with the Dynamic Thermal Guard which consistently monitor the SSD and works automatically to maintain the temperature of the drive in order to protect the drive from overheating. And if the temperature increases from normal, it pulls it down instantly without sacrificing the performance. The newly upgraded Samsung Magician Software is also included in its package. The ultimate software permits the user to invigilate, manage and maintain the SSD drive. The software allows you to track data, manage storage, update the drive with the latest firmware, and also to protect your data with a password which will secure all the important data from an unauthorized access. You can also schedule an automatic firmware update and makes your drive’s performance up to date. With the M.2 form factor, it also includes a number like “2280” in its specifications. Which means that the SSD is 22mm wide and 80mm long. So, it is perfectly suitable for the latest motherboards. In addition, it includes a Samsung 500 GB 960 EVO NVMe M.2 internal solid state drive, a user manual, and a 3-year warranty card in its box. The Samsung 960 EVO 500 GB is a remarkable and trusted drive to boost your computer performance. It is an exceptional choice for any desktop computer and laptop which supports PCle drives. It provides the best transfer speed with the maximum security of your data. Here we listed some of its admirable features which makes it attractive and highly reliable. Excellent read and write speed. TurboWrite technology boosts the write speeds. Latest V-NAND technology with the thermal guard protection. Advanced Polaris controller by Samsung. 256-bit AES disk encryption for providing security. Included Samsung Magician Software of managing and securing data files. Comes with AES 256-bit encryption. The Samsung 960 EVO 500 GB NVMe – M.2 Internal SSD provides your computer a performance boost. With the V-NAND technology along with the thermal guard protection, it ensures the reliability and safety of your data even in heavy workloads. The NVMe interface with the Polaris controller strengthens the SSD to deliver the fastest read and write speeds. It also provides a software to manage and secure your data. Overall, it is a perfect drive designed by Samsung to provide the best performance in intense computing tasks like gaming and video editing.